From fishing in the lake for Old Muley to fishing in the closet for just about everything else, Wartime America's favorite couple keeps the fun coming. Head on down to Wistful Vista and hear it for yourself in this collection of comedy classics from 1944 and 1945! 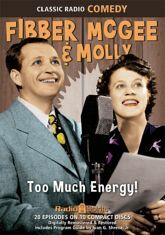 Jim and Marian Jordan star as Fibber McGee and Molly -- with Arthur Q. Bryan as Doc Gamble, Shirley Mitchell as Alice Darling, Bea Benaderet as Mrs. Carstairs, Marlin Hurt as the unforgettable Beulah, and Harlow Wilcox selling the Glo-Coat!